The word, feminist, used to conger up images of man-haters and bitter women for me. But somewhere along the way, my ideas changed about that. I'm not exactly sure when they changed, but I know it began when I watched the documentary of Half the Sky, when I read books like, A Year of Biblical Womanhood and Why Not Women. My old interpretations of certain passages broke apart as I delved into the context, words, and meanings of that culture; I saw a much different message than I'd grown up with. Jesus led out in this so beautifully. He was one of the first to rally behind women and show the world the injustice of thwarting his plan of unity. He taught women in a culture where it was unheard of and gave them a place with the rest of his disciples, listening at his feet. He didn't treat them as less or scold them for wanting to learn. It's no wonder Mary lovingly called him her teacher. I especially love the story of how he handled his resurrection. Jesus commanded Mary to tell the disciples he was alive. He didn't tell John or Peter, who had been with Mary only moments before; he waited until they were gone and revealed himself to Mary. If Jesus really didn't want women telling men anything, then why did he hand Mary the most important message in all of Christendom? The climax of the story and he gave it to a woman. I have a hunch on why he did that. I think he knew this story would be told countless times, and always would be Mary smack dab in the middle carrying the message to the disciples. Jesus led out in what he wanted the church to start, a revolution. A revolution of inclusion and love. I imagine it to be one of a community so entwined that you can't see the arm for the nose, the foot for the head. One that doesn't separate based on color, status or gender; but one that's woven so thickly together in love that nothing can penetrate or tear it apart. This is the feminism I want to be a part of, full of compassion, understanding and co-submission. A team of people dedicated to working and growing together in such a passionate tenderness that no voice is unheard, no person is silenced. Where there isn't a need for limiting others, only a group effort like a wave rushing together over the shore. What could we do for the world if we didn't leave half of our team behind? That's what I'd love to know, it's why I'm a Jesus Feminist. Because I believe that we, joined together side by side, could make a giant difference in the world. And I think Jesus knew that too. 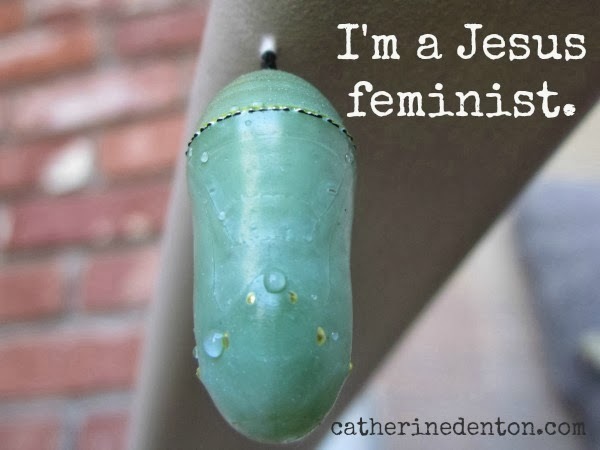 Today I'm joining Sarah Bessey's Jesus Feminists synchroblog. I love this, Catherine. Very well said! I like your message today. I agree. Jesus tries to teach us to act with justice, to consider everyone as equals. I also think of the young mother Mary, unwed, fearing for herself and her child, then lifted up and honored. Blessings to you. That is a sweet thought, Mary.